Precision TX™ is an advanced, minimally-invasive technique that helps stimulate collagen production to give our face a more youthful appearance. As we age collagen production slows, when your body produces less collagen, you can start developing wrinkles and your skin becomes thinner and less elastic. Precision TX™ is sometimes called an “instant facelift”, thanks to how quick it is (about one hour), its high success rate, and because it doesn’t require surgery. Precision TX™ is best suited for contouring the lower half of the face, including the jaw, chin, cheeks, and neck. The best part about Precision TX is the self-confidence that comes with it. After a Precision TX™ treatment with Dr. Godwin, you will look as great on the outside as you feel on the inside. If you have mild to moderate fatty skin laxity or loose skin in the lower face, neck or jowls you are an excellent candidate for Precision TX™. Typically a Precision TX procedure takes approximately one hour and is performed in our surgery center at our office in Yardley, Bucks County. 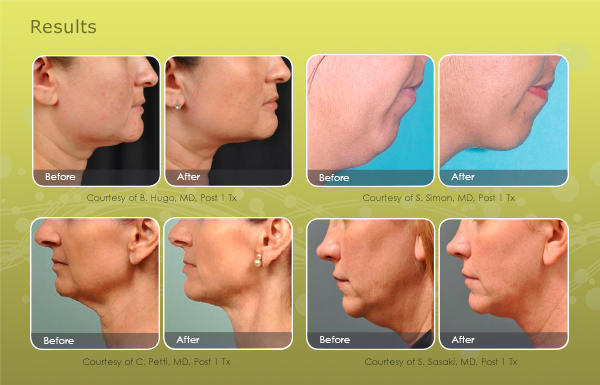 Dr. Godwin usually performs Precision TX™ in conjunction with SmartLipo of the neck. You may have some swelling and soreness after the procedure, but you will see a noticeable difference in your skin and jawline immediately. Full results of the skin tightening and firming benefits will be visible when the new collagen develops a couple months following the procedure. If you are unhappy with the way your face has aged over the years or dislike the appearance of your double chin, but don’t want a surgical face-lift, then Precision TX is right for you. Dr. Godwin has performed Precision TX™ on both men and women who are looking to refine their jaw & neckline and restore their youthful appearance. For the care of a double board-certified Plastic surgeon with extensive experience in performing body contouring procedures on both men and women, book your appointment for a personal one-on-one consultation with Dr. Kenneth Godwin. Dr. Godwin will listen to your goals and desires and educate you on all aspects of the Precision TX™ treatment. Together you will decide if Precision TX™ is the right choice for you. For the care of a skilled plastic surgeon that genuinely cares about his patients, call Bucks County Plastic Surgeon Dr. Kenneth Godwin today at 267-399-9930.